Summer can be a quiet time for falconers with a moulting bird. For me, it’s a time to learn more about my Hunting Hawk and see how she does with a regular routine. The feathers are coming in quite nicely, I can’t wait until her tail is full summed. Her wings are going to be very dark and the front of her chest is already getting some colored streaks to it. She may or may not lose her belly band this year, but that remains to be seen. Some red-tails don’t lose it until the second season. 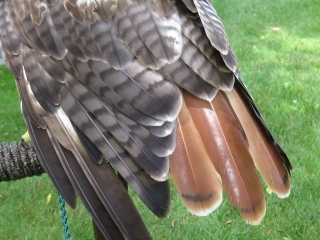 In the picture above, Tahoe has lost all of her immature tail feathers, and you can notice the difference in coloration between the newly grown feathers in the secondaries on the wing (they are darker). The red tail feathers continue to grow in. Keeping the mews clean has been quite a challenge, as it looks like someone went in there and had a pillow fight!